Jeremy kept thinking about how he’d been able to fight off Leo. Most sixteen-year-old boys wouldn’t have been able to do what he did to a thirty-something man, especially one as strong as Leo. But he’d done it. He’d damaged Leo enough that it was doubtful that he’d be back. Why his mother would have a boyfriend like Leo continued to confuse Jeremy. That continued to make him worry about where his mother was. It had been five months since she and Leo had left without letting Jeremy know where they were going. Jeremy needed to figure out what to do next. At first he hadn’t slept well that night after Leo had attacked him; he woke up from a dream about Leo coming back to shoot him. Then he had a hard time falling back asleep. But he finally crashed for good at eleven-thirty. He didn’t wake until the alarm sounded next to Mike’s side of the bed, and it woke Jeremy as well. He let out a loud, long yawn. “Morning to you too, boyfriend,” Jeremy replied. “Jeremy, are you going to go to school today?” Mike asked. Mike’s mom was getting breakfast ready when they came downstairs. “Let me know if you want eggs,” she said. “Two for me,” Mike said. “Okay, two for me, too,” Jeremy added. From the minute they got in the car, Mike’s dad started asking Jeremy questions. “That’d be pretty expensive, wouldn’t it?” Jeremy asked. Jeremy saw Lyle walking down Bearwood Lane toward Brighton Way on his way to school. Lyle turned and saw who’d called his name, smiled, and walked up to the car. “Alright. How long will it take you to walk home?” Mike’s dad asked. “Whoa! You bent the frame? You were in an accident?” Lyle asked. “We will. Thanks a lot for the ride,” Jeremy said, and waved a goodbye. “Thanks, Mr. Butler,” Lyle added. Jeremy ordered a dark chocolate latte with an extra shot of espresso and a cinnamon roll. “That sounds good,” Lyle said. He ordered the same. They sat at a table inside next to the window. “This is a cool place,” Lyle said. “He complained about Northgate High’s class periods. He said they change every day, and it’s very confusing. He gave me a copy of the bell schedule. It has two parts. Sort of an overview and then a weekly schedule showing how the start and end times for periods are changed day after day. “That includes me, right?” Jeremy said, then grinned. “Of course, you’re on my ‘friends’ list, definitely on the non-partying side,” Lyle responded, also with a grin. “Oh, one thing, please don’t tell anyone about what happened between me and Leo yesterday,” Jeremy requested. Except for Pre-Calc Jeremy’s morning classes went by quickly. The Pre-Calc test first period was grueling with nineteen complex problems to solve. He had time to go back and review his solutions, which had to be detailed with each problem, and to make sure that his answers looked like they made sense. The test took the entire fifty-minute period. Jeremy looked at his test paper. He figured doing anything more would just mess up what was probably correct. He saw Lyle in Honors English 3 second period. “How was Spanish?” he asked. There was a lot of moaning and grumbling, but Jeremy felt that there was no reason for it. Everyone in the class knew they had a Shakespeare play assignment; it was in the syllabus. He decided people just liked to complain. He and Lyle went to APUSH, Advanced Placement United States History, next. Mrs. Lehman reviewed what would be on the second semester midterm exam. It was for this class that they had set up the study group along with Mike, Greg, and Nikki, their friends who went to Northgate High. In Creative Writing they turned in the short stories they’d written and Mr. Kelly started picking students to go up to the front of the class to read their story. Jeremy and Lyle weren’t picked. “We’ll finish up tomorrow,” Mr. Kelly told the class after they heard the first bell. When he got to the cafeteria about five minutes later there seemed to be some sort of action going on in the back corner of the cafeteria. He looked around for Lyle, but couldn’t find him. Almost everyone was standing, trying to see what was going on. The school resource officer was there, as well as the vice principal and the cafeteria manager. Jeremy heard his name being called so he turned and saw a friend, Cam Sykes, waving at him. He worked his way through the crowd. “What’s going on?” Jeremy asked. Jeremy immediately thought of Leo. He stared at the melee and saw the young kid, and Cam agreed he was the one who the man had harrassed. Jeremy knew the kid. They’d met in middle school when they were both taking beginning guitar to meet their music class requirement. “If you need a hand, just wave and I’ll come,” Cam offered. Jeremy pushed through the crowd of kids and made his way to Sean. Jeremy moved to where the school resource officer was standing. “And who are you?” the police resource officer asked. “You got it,” Curt replied. He scooted back off of Leo’s shoulders onto the middle of his back, leaned forward, grabbed both sides of Leo’s head and twisted it to the left so both Officer Dodd and Jeremy could see clearly. It definitely was Leo. Curt lifted Leo’s head, turned it face-down, and smashed it into the floor. Leo groaned. “Oops! Sorry, your head accidentally slipped out of my hands.” He shifted his weight back onto Leo’s shoulders, and Leo groaned again. Officer Dodd placed a call on his cell. Jeremy assumed it was to the Walnut Creek police. He pulled out his cell and dialed Roger Butler’s cell number. Jeremy looked around. He walked over to where Vice Principal Sorensen was standing with the cafeteria manager by the end of the cafeteria line, near the cash register. “Jeremy Sievers. Here’s my student ID card.” Jeremy held up his student ID. “He is, or he was, my mom’s boyfriend. He’s a real jerk.” Jeremy went on to relate what Leo had done the night before. As if Jeremy had wished it to happen, two Walnut Creek police officers entered the cafeteria, accompanied by the principal. “Wait here, Jeremy. I’ll have one of the police officers come over to talk to you,” Vice Principal Sorensen said. After a few minutes one of the policemen came over to talk to Jeremy. “Sure.” Jeremy told him the number, and Officer Deering entered it in his phone. There were still kids standing around in the cafeteria looking to see if there was any excitement. Jeremy looked for Sean, and he saw him talking with Cam, who grinned and waved at Jeremy. Finally, Leo was dragged out of the cafeteria to be put in the back of a police car for transport. Hopefully, Jeremy thought, to jail this time. Jeremy looked around for Lyle but still didn’t see him. So he sat down at a table at the other corner of the cafeteria and ate the two meatloaf sandwiches and chips Mike’s mom had fixed for him. He put the apple in his backpack for later. The test in his AP Chemistry class was much longer than the one in Pre-Calc, but it was easier because there were no problems to solve. It had both true-false and multiple-choice questions, and some with answers that had to be written out. A total of ninety questions. Jeremy figured that it would take about as long to finish as the Pre-Calc test. He was glad that he’d studied for the test Wednesday night, the night before Leo showed up at his house. Jeremy was about two-thirds through the questions when a student monitor from the office walked in. Jeremy glanced up, and when he saw who it was he went back to his test paper. A few seconds later he heard his name being called. “Jeremy Sievers, please come up to my desk,” Mrs. DePaulo called out. He put his pencil on the desk, turned over his test papers so no one could see his answers, and walked to the teacher’s desk. “Thank you, Mrs. DePaulo.” Jeremy went back to his desk and continued answering the test questions. After a few minutes the vice principal’s secretary walked in and talked to Mrs. DePaulo. Jeremy tried to ignore what was going on at the teacher’s desk, but he knew it was about him. He still had ten questions to finish, and he decided that he’d refuse to leave until he was finished with the test, including going back and checking all of his answers. “Okay, I guess.” Jeremy turned over his test papers and walked out of the classroom. “Do you know what these men are going to talk to you about?” She looked concerned, like it might be a problem. “Alright. Go finish your test and when you are ready, go to the administration office. Good luck on your test.” She smiled, turned and left. Jeremy finished answering the rest of the questions on his test paper, then went back and checked all of them. No changes were needed. He looked at the clock and saw it was one-thirty. Ten minutes left in fifth period. He gave his test papers to Mrs. DePaulo. Jeremy gave her a little wave, said, “Okay, see you,” and left to meet with the men from the ATF. As he walked from the science building he thought about what sort of problem Leo might have with the ATF. They’d been sniffing around the day… wow! Was that just yesterday? He shook his head. So much had happened so fast. It seemed like he got the phone call from Mrs. Markenie a week ago, not yesterday morning. He stopped. He remembered that Mr. Butler, Mike’s granddad Roger Butler, told him that he should be present if the ATF people wanted to interview him. He pulled his cell out of his backpack and dialed Roger Butler’s number. “Hi, Mr. Butler. I’m at school and the ATF men are here and they…” Roger Butler interrupted him. “Okay, I’m on my way now.” He ended the call. When he arrived at the conference room the door was closed. He knocked, and Mr. Butler opened the door. Jeremy walked in and Roger Butler closed the door. “Jeremy, this is ATF Compliance Agent Roberto Gonzales, and this is Agent Wil Krietz,” Roger Butler said. They shook hands with Jeremy. Agent Gonzales was middle-age, Agent Krietz was young, maybe in his late twenties. “Thank you,” Agent Krietz said. He turned on a small recorder that he put in the middle of the table. “Yes, my student ID card.” Jeremy pulled out his wallet and handed the card to Agent Krietz. “We are meeting with Jeremy Alan Sievers…” He continued reading Jeremy’s age, birth date, address, and phone number, his school, his grade, and his student ID number. “Is this information correct, Jeremy?” he asked. Roger Butler nodded, so Jeremy gave them his cellphone number. Agent Krietz returned his student ID card. Agent Krietz continued. “Jeremy Sievers is a minor, so he is accompanied by Mr. Roger Butler, who is a registered legal services attorney licensed to practice law with the State Bar of California.” He read Roger Butler’s address and phone number, which Roger Butler confirmed. “Mr. Butler, if it’s acceptable, I’ll ask Jeremy Sievers some questions now,” Agent Krietz asked. Jeremy detailed what happened, the same way he’d detailed it so many times before. There was one thing he wanted to make very clear, however. Jeremy was giving the ATF agent more information than he were asking, but he figured he’d tell everything he knew about Leo. “When was the last time you saw your mother?” Agent Krietz asked. “The eighth of September, the day before they left.” Agent Krietz seemed surprised at that answer. Jeremy started to worry that they might report him to Child Protective Services. “Do you have any questions to ask me, Jeremy?” Agent Krietz asked. “But why would the Bureau of Alcohol, Tobacco, Firearms and Explosives have any interest in a jerk like Leo? It just doesn’t make any sense to me,” Jeremy said. “I wouldn’t say anything between me and Leo was a lot of contact. I tried to stay away from him. The only face-to-face contact was when he attacked me last night and I defended myself. Agent Krietz asked Roger Butler if he had any questions or could offer any information about Leonard Rivers. The ATF agents stood up and so did Jeremy and Roger Butler. They said their goodbyes and the two ATF agents left. “What’s a transcript?” Jeremy asked. “I guess we’ll see what they send us, won’t we,” Jeremy said. “That covers it, Jeremy.” Roger Butler grinned. If you enjoyed reading this story, please let me know! Authors thrive by the feedback they receive from readers. It's easy: just click on the email link at the bottom of this page to send me a message. 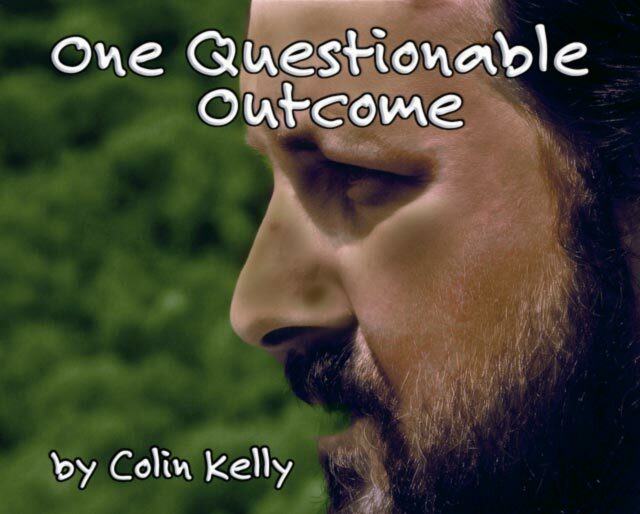 Say “Hi” and tell me what you think about ‘One Questionable Outcome’. Thanks. This story and the included images are Copyright © 2016-2019	by Colin Kelly (colinian). The original image is Copyright © 2005 by Marius Largu | File ID #1568370 Freeimages.com. They cannot be reproduced without express written consent. Codey's World web site has written permission to publish this story. No other rights are granted.